Get a free UKPaintball ticket for five (RRP £42.95). 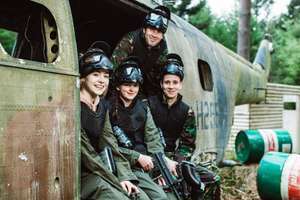 With over 70 of the UK’s premier paintball parks to choose from, you and four friends will battle through the action packed forest scenarios. Armed with the latest semi-auto paintball guns and camo outfits it’s time to clock into the battlefield. Each ticket includes, equipment hire, semi-auto gun rental, eight - ten Paintball games, full training, Marshals to host the event, a hot lunch (at participating centres) and 100 free paintballs. Offer Goods/Services: This voucher entitles you to a free UKPaintball ticket for five (RRP £42.95). Minimum age 15. Not suitable for pregnant women, people suffering from epilepsy, high blood pressure or heart conditions. Valid for Full days only. Must be redeemed within the validity period. Your event is not confirmed until you receive a confirmation email from UKPaintball. To confirm your booking you will be required to pay for 100 paintballs per player (excluding the group organiser) which will be given to you on the day of your event. 100 Free paintballs for the organiser are only included when all five players are booked on. Players that fail to attend on the day forfeit their 100 paintballs as way of deposit. Payments are non-refundable and paintballs cannot be transferred to other members of the group. Please allow at least two weeks’ notice when booking. Put the O2 Priority app on your phone and you can get the offers too. I've been using the app for years on my EE contract. Put the O2 Priority app on your phone and you can get the offers too.I've … Put the O2 Priority app on your phone and you can get the offers too.I've been using the app for years on my EE contract. I have to verify it with an o2 number. Probably will end up just ordering a free sim so I can register! I have to verify it with an o2 number. Probably will end up just ordering …I have to verify it with an o2 number. Probably will end up just ordering a free sim so I can register! Ends up costing £32 as only one individual gets 100 free paintballs, rest have to pay £8.00 each. Ends up costing £32 as only one individual gets 100 free paintballs, rest …Ends up costing £32 as only one individual gets 100 free paintballs, rest have to pay £8.00 each. No need to obtain an O2 SIM. Just need to know someone that uses the O2 network. These deals are always a gotcha, because 100 paintball will be gone in the first hour if that!. Also everyone else has to buy thier own. The paintballs is how they make money. Im completely for making money , but it should be honest and everyone should be aware what they are getting into. For example if they said that the average player uses 500 paintballs and they cost £10 for 100, then I would be fine with that, as you can decide if it's for you. Nah, just have a friend on O2. These deals are always a gotcha, because 100 paintball will be gone in the …These deals are always a gotcha, because 100 paintball will be gone in the first hour if that!. Also everyone else has to buy thier own.The paintballs is how they make money. Im completely for making money , but it should be honest and everyone should be aware what they are getting into.For example if they said that the average player uses 500 paintballs and they cost £10 for 100, then I would be fine with that, as you can decide if it's for you. This. I used to play a lot of paintball but stopped because I got sick to death of firms creating missions that were designed purely to make the players expend as many rounds as possible. This. I used to play a lot of paintball but stopped because I got sick to …This. I used to play a lot of paintball but stopped because I got sick to death of firms creating missions that were designed purely to make the players expend as many rounds as possible. Well again that's fine if they are all up front about it including pricing structure.